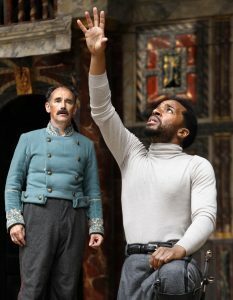 Shakespeare’s Globe has pulled out all the stops for its production of Othello, enticing Oscar-winner Mark Rylance back to the Wooden O and bagging TV’s man-of-the-moment, American André Holland to play The Moor. But strip away the starry casting this is a hard Othello to appreciate. It smacks a bit of nepotism with the production being directed by Rylance’s wife, Claire van Kampen, and, gosh, this is heresy I know, but I just didn’t get her comedic take on one of Shakespeare’s greatest villains. We all know that Rylance is a remarkable actor, and, after once being The Globe’s artistic director, he is at home on its stage. But was it only me at last night’s opening who had trouble understanding him? He tore through his dialogue as though he wanted to get out and make last orders at the pub. Great speeches and telling moments blurred into a one-note delivery, giving little emphasis to the great and bolstering the mundane. 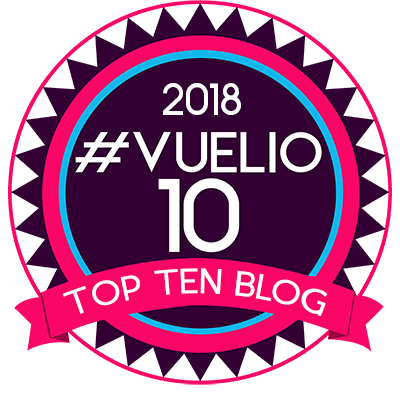 Constantly mopping away the sweat – yes, it was a hot night but it was a little distracting – he reduced his lines to one long verbal train of continuous thought so that it was difficult, if you didn’t know the play, to understand Iago’s reasoning and motivation. Critics become blasé about reviewing the great classics and often assume that everyone in the audience has their depth of knowledge. 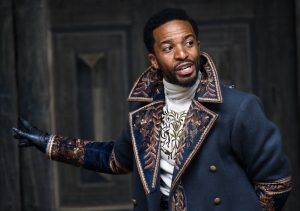 But, particularly at The Globe which very much a tourist attraction as well as a bona fide theatre, some of the audience, less schooled in the play, would be at a loss to understand why Iago is dripping poison into Othello’s ear. Here is an Iago who isn’t menacing or sinister. He’s the little man scurrying around after his master, consumed with child-like petty jealousy and an unfathomable determination for revenge. It’s usually assumed that Iago and Othello were best friends, or at least, soldiers-in-arms. 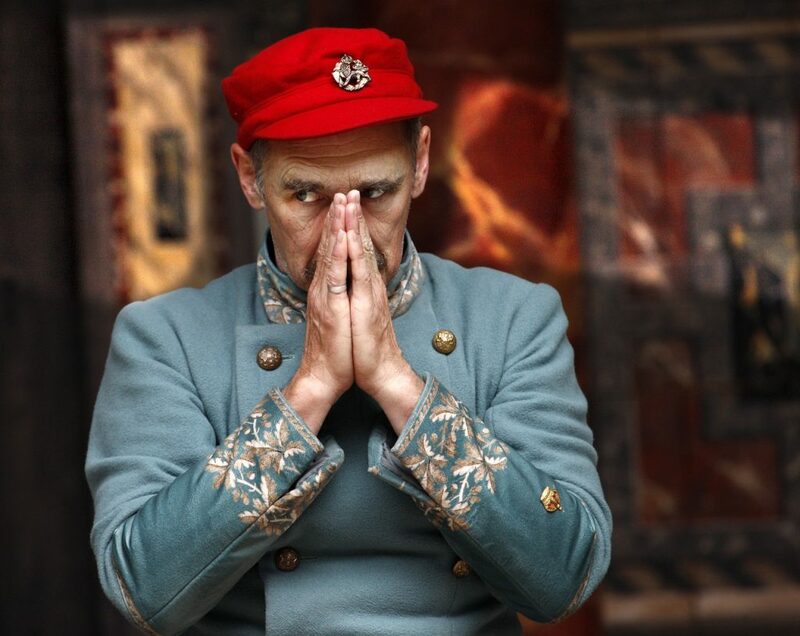 Here, Rylance’s Iago, preposterously dressed like a cross between Super Mario and a bellboy (not Jonathan Fensom’s best costume designs), appears low-ranking and overly servile. There’s a permanent smile on his face as he leads the carousing, scampers at the heels of Othello, and plots revenge. But what was the catalyst? It’s hard to discover when “have a drink” is given as much importance as “I hate The Moor”. While pondering these questions I have to admit I rather enjoyed Holland’s first appearance at The Globe. While the programme notes that he has performed Shakespeare on stage in the US, he is primarily known to the Netflix generation over here for The Knick, American Horror Story: Roanoke and, lately Castle Rock, another horror series. His Othello is very much a lover, not a fighter. He can’t keep his hands off Jessica Warbeck’s underwhelming Desdemona. There are nice touches to his performance when he throws in a look, an aside, or even a glance up at the seagulls laughing in the sky up above the theatre. But he has a tough fight to steal attention away from the scampering Rylance who positively breaks into a trot when on stage, his movement as breathless as his performance. Van Kampen has thought little about sightlines when planning the production. Those of us sitting on the left wing of the auditorium missed the climax – Othello’s brutal revenge on his cheating wife – completely because the tragic bride’s four-poster was too far to the back of the stage. I had a lovely view of two pillars but could see nothing of the violent retribution meted out by The Moor, or the aftermath. And did she really have to labour the “honest Iago” phrase, which was delivered by everyone with a knowing look to the audience as though we were watching a panto? Too many lines elicited laughs from the opening night audience when I’m pretty sure that William Shakespeare had intended Othello to be a tragedy. Sheila Atim, always watchable, seemed miscast or perhaps just mis-dressed as Iago’s wife and Desdemona’s aide, Emilia. She strode on stage as though it were a catwalk in a couple of Fensom’s stunning creations that looked totally wrong for the character. Indeed the fashion plate appeared much better dressed than her mistress, who was burdened with a dull, black velvet frock that appeared to have been run up from curtains. Aaron Pierre makes a good job of Michael Cassio and Steffan Donnelly plays an engaging failed-suitor, Roderigo, but both struggle to come up from beneath Mark Rylance’s overpowering and showy blustering. A workmanlike but ultimately disappointing Othello although fans of both stars will no doubt enjoy it. Running at The Globe until October 13. Mark Rylance turns Shakespeare’s most sinister & Machiavellian of villains into a fawning clown in his wife’s disappointing and workmanlike production of Othello at The Globe. 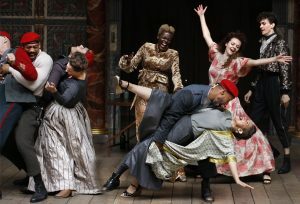 Having read the fawning appraisals of the Globe’s “Othello” I was inclined to believe that I must have been watching a different play from the rest of the critics. However this review is I think the most accurate assessment of the play to date. There was no real alteration of light and shade in the play, speeches were galloped through and the central theme of the play (racism) was lost amidst a fondness for the cheap laugh and a bit of audience participation. Sheila Attim dressed as Grace Jones strutted her stuff on the cat walk but simply lost all the subtle nuances of Emilia’s domestic conflicts and horrified realisation of Iago’s murderous treachery. 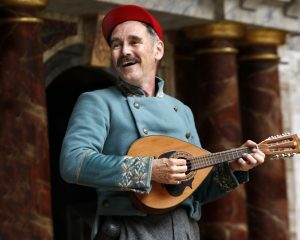 Rylance seemed happier to caper around the stage as a comic jester and the most lively bit of Desdemona’s performance only occurred whilst being strangled. Othello was occasionally engaging but was rarely fully convincing. In short it was a somewhat pedestrian performance redeemed only by its speed of delivery.